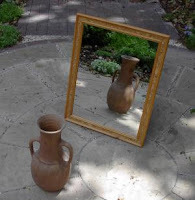 Conceptual Physics: Why do mirrors show left as right and not top as bottom? Why do mirrors show left as right and not top as bottom? It is a misconception that most of the students pose the question as above. Mirror only shows the reflected image of the object before it. standing before the mirror. It is the bi-symmetry of the human being which is exactly reflected in mirror as our left being right and right being left. Hence we get confused with it. To be more clear the light reflected from our left side will be falling on the mirror's right side relatively.Where as reflected light from top falls on the top side of mirror and from bottom falls on mirror's bottom side. Hence we see that top is not reversed to bottom.